If you follow me on social media sites such as Twitter or Facebook, you know that for over two years I’ve been posting daily tidbits of skeptic history just like the above. It’s a attempt to help connect the many people new to skepticism with the rich history of the movement. As I’ve researched this, I’ve found that some dates on the calendar had very few events associated with them, while others were rich with history. But the daily post format meant I would usually only post one item per day. Other items on the same date would go unseen. This led me to seek out new ways to use this information. Today in Skeptic History is now an free app offered by the James Randi Educational Foundation (JREF), compatible with iPhone, iPad and iPod Touch. Read on for more details on what it offers. Finding these dates has been an interesting project, and is continuing. I began doing it just on a lark, tossing the dates I found into a Google Calendar, just to see what I could find. The idea to publish the info came later. Often I stumble on them in the course of the reading I do as a skeptic. Sometimes I spend a few hours surfing around Wikipedia and other sites searching for something based on an idea. I’ve also occasionally sought out deeper resources in my local libraries. Once when I was in Florida on business, I made visit to the JREF’s library in Fort Lauderdale. Mr. Randi has some fascinating old books on the paranormal that were a great resource. The research helped remind me of the strange behavior of random numbers. Since I was posting these things daily, one of my goals was to have at least one event for every calendar date. But as skeptics know, random numbers (like dates) are notoriously uneven. They occur in weird bursts and lulls that have no real pattern to them. So even after I had over 1,000 events documented, approaching an average of three events per calendar day, I still had dates with nothing on them! Frustratingly, I had other dates with up to eight or nine events. Eventually I achieved my goal, but it was an interesting lesson about randomness to re-learn. As the calendar began filling up, I started posting the items via social media. Later came the podcast segment. And yet still I had events in my database that weren’t being used. I started wondering about other ways make use of them. I’ve long been a supporter of the JREF. It was my attendance at their annual Amazing Meeting event in Las Vegas that got me involved in skepticism. So I was naturally receptive when JREF President D.J. Grothe mentioned the fact that the foundation was interested in publishing some iPhone apps. 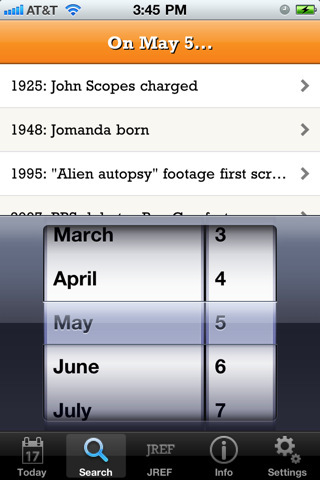 We decided together to turn my skeptic history database into one of those apps. The project took several months. I supplied the data and other support, and JREF got programmer Mike Vargas to build the app. It was released in the Apple iTunes Store yesterday afternoon. The app does pretty much what you expect it to do. 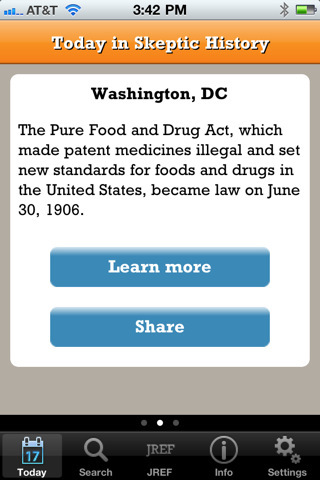 When opened it displays by default an event that happened today in history that relates to skepticism, as seen at left. If there is more than one event you can “swipe” to the side to see the others. (A set of dots below indicates how many events there are, on the day pictured at left there are three events). There are anywhere from one to as many as nine different events on each day, all through the year. There are two buttons that can appear on each event screen. The first button, “Learn more” will navigate you to a web link that has further details about that event. Often this is an article in Wikipedia, but it will sometimes be on a skeptic web site such as randi.org. The second button, “Share” will allow you to share the event using Twitter or Facebook, so you can get other people interested in skeptic history just like I’ve been doing for two years now. You can also tap the Search button at the bottom of the screen to choose other dates to display. A typical screen display including the search function is shown at right. A list of the items for the matching day is shown above the search control, and you can tap any of those items to jump into that day and look at it just as if it were today. If you wish to return to today’s events, tap the button that says Today. The other buttons at the bottom of the screen will display information about James Randi and the JREF, and information about the app itself (including how to contact me). When you first install the app you will be asked if you would like a daily notification about that day’s skeptic history. You can also change this choice using the settings button at right when in the app. The alert will automatically pop up a list of that day’s skeptic history events in the morning. You can tap it to see more details in the app. It is a good way to get a nice, daily dose of skeptic history. One feature you cannot see in screen shots is that the app knows how to automatically update its data over the internet. So as we discover new events to add, they will automatically appear on everyone’s iPhone. No update process necessary. The event database currently contains over 1,300 events – an average of over 3.5 events per day. Every day in the year (including Leap Day) has at least one event. A few days have as many as nine different historic events. (Can you find them? There are three). I’m always seeking additional events, and corrections to existing ones. A few months ago I posted a list of key events I still need here. Now that the app is available, you can peruse the entire database and check to see if you know other dates I may have missed. Please contact me if you do. So please download the app and enjoy. Special thanks to the many folks who have helped me find items to put in the database or otherwise supported the project including Jim Lippard, Lei Pinter, Sid Rodrigues, Susan Gerbic-Forsyth, Blake Smith, Ben Radford, Phil Plait, Derek & Swoopy and Bart Farkas. This entry was posted in meta, Skeptic History and tagged jref, smartphones on July 1, 2011 by Tim Farley. That seems to be the biggest question or comment so far on the app. The JREF indicated on their Twitter account that it is “in the works,” but I can’t comment further. I have an Android phone myself, so I sure want it to happen. Turn it into a Facebook app as well. Also an embeddable widget for web sites would be very useful, so skeptical blogs can showcase this information as well. Oh, interesting, I hadn’t thought about doing a widget version. I’ll look into that. Is there a list online? Was thinking of doing a wall calendar for my home. No, it’s not all together online anywhere right now. We might do that at some point. You can look back through my Twitter feed to see the last year or so, I post one at 9 am (Eastern US time) every day.